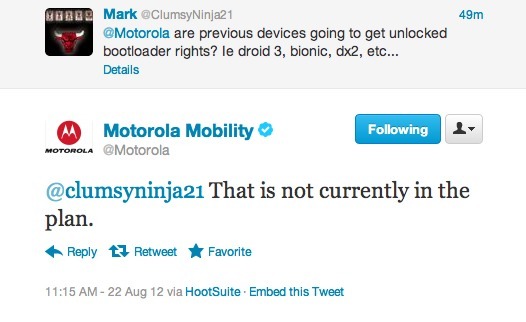 To no one’s surprise, Motorola mentioned on Twitter today that older devices such as the DROID Bionic, DROID 3, and DROID X2, will not be a part of the unlocking program that they launched at the end of last week. At least they are currently not in the plan. The only devices on the list of participants, includes the newly launched Photon Q (which we unlocked), the European RAZR Developer Edition, and the XOOM. They didn’t mention anything about the DROID RAZR, but it would surprise the hell out of me to see anything but new devices receive the unlock treatment. At this point, you should probably focus your attention on getting the RAZR HD unlocked. Wednesday Poll: Which Type of 4G is Better?